All primates, humans, other apes and monkeys, produce a large variety of calls. Yet only humans possess language and music. Theses abilities require the sensitivity to dependencies. Humans expect a sentence to contain an agent and the corresponding verb; or a melody to consist of notes relating to each other. Is this “dependency-sensitivity” equally unique to humans or is it also present in other primates? 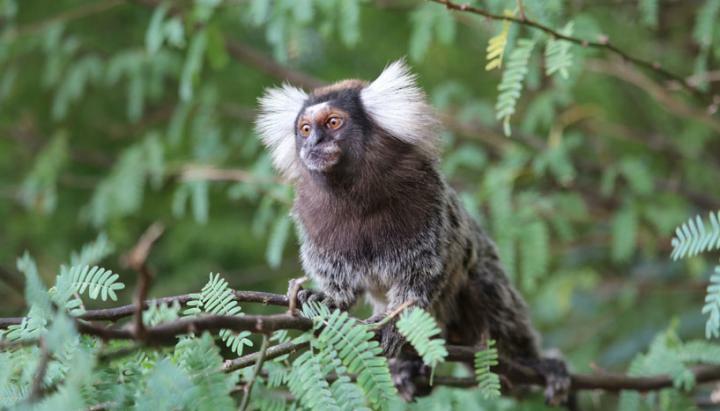 To answer this question, Stephan Reber & Vedrana Šlipogor and colleagues at the Department of Cognitive Biology at the University of Vienna looked at common marmoset monkeys. This species belongs to the New World primates, which split from the Old World primates (including humans) over 30 million years ago. The researchers exposed marmosets to sequences of peep tones, which started and ended with a low tone and had varying numbers of high tones in between. The low tones created the dependent elements and, as in language or music, they could be at varying distance from each other. After the monkeys had heard hundreds of these sequences, they were individually attracted into a test apparatus and heard two types of novel playbacks: sequences which followed the same pattern as before (some having different numbers of high tones between the two low ones) and sequences which lacked either the first or the last low tone. The latter sequences were therefore missing a dependency. The researchers then checked whether the marmosets looked more toward the loudspeaker for sequences with or without dependencies. They used a specialized software created by co-author Jinook Oh, which could automatically track the marmosets’ head movements. This procedure allowed for an unprecedent precision of behavioral coding. “The difference between sequences with and without dependencies is probably of little relevance for our marmosets. This is why we designed a setup which could detect even the smallest head movements”, explains Reber. The marmosets indeed discriminated between the playbacks. They turned more often toward the loudspeaker when hearing sequences with dependencies. “This was rather surprising as primates usually look longer at inconsistent stimuli during such experiments. A preference for familiar sequences is however frequently observed in studies on human infants”, says Šlipogor. The presence of dependency-sensitivity in marmosets suggests that this important aspect of language was already present in the common ancestor of Old and New World monkeys, of marmosets and humans. “Common marmosets are sensitive to simple dependencies at variable distances in an artificial grammar”. Evolution and Human Behavior.